Discussion in 'Fishing' started by bldsmith, Aug 24, 2015. I began working for my son as a deck hand on his new commercial fishing boat. Went out on his first Albacore Tuna trip 2 weeks ago. Here was a bunch we caught in about 30 minutes. 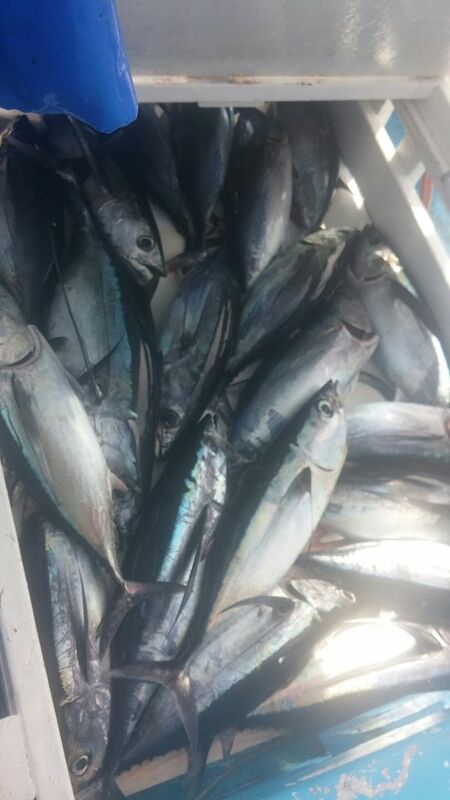 In all we picked up 3400lbs all caught by trolling. Fish ranged from 8 to 30lbs. 250 in all. Lots of fun. 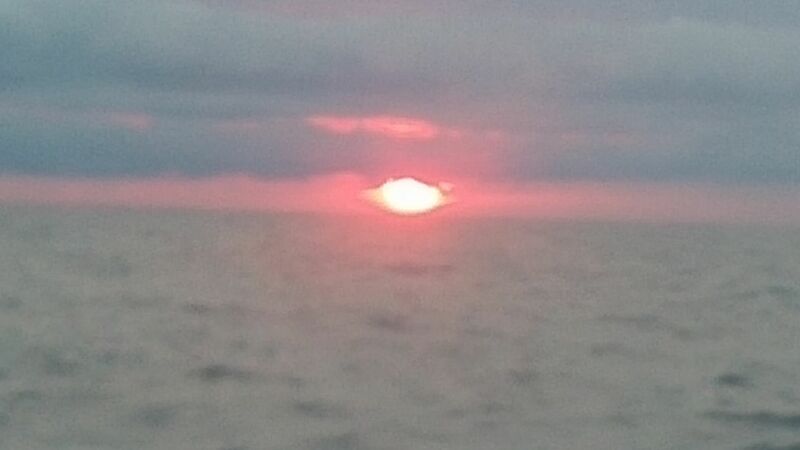 Not common to see the sunrise over the ocean on the west coast. Sorry for the cell shots, Hard to catch a good pic when the boat is rocking and a rolling. Galveston340, Chopperdrvr, Brian Shaffer and 2 others like this. Gotta be very proud of him on his new endeavor. Nice catch there. Fresh sure beats that rot glopping out of a can. Indeed, that's a ways out for that pic. Congrats. We went out 60 miles and spent 5 days at sea. Been a long time since I done that. He is a very hard worker and I am proud of him. I am also proud of his OLD man getting through the trip with no major injuries. A bit of pain but I can deal with that. Got some good drugs, all legal. I've been taking Krill Oil supplement for over a year now. I'm hardly ever using ibuprofen any more. Before, I kept a large bottle at home, a small bottle in my vehicles (all of them), and generally started with six... and go from there. Still hurt, but manageable w/o now. Whales are good eating too. Floured, and pan fried in onions with brown gravy. Any type of commercial fishing is very hard work and very dangerous. You all be careful out there and the best of luck to you also!! FISH FISH!! Looks like fun! I never caught a tuna, those are all caught on rod and reel?? I would like to do tuna fishing, but you gotta guarantee smooth seas. Me and motion sickness have a long relationship. It was very hard work. 16 hours a day from 5 am to 830-900pm. They were hand lined pulling squid clones running 6kts. I need to get the video of his first fish on the boat uploaded. Turned out to be one of the biggest of the trip, 26lbs. Biggest was 30. I landed 90% of the fish while he got us on em. It was a hoot at times. 5 lines going off at once then several others while getting them in. I have a much greater respect for commercial fisherman. It can be dangerous. We do not go out on deck without a PFD on. and when out on deck the other knows and is watching. Man that is a lot of fish! IIRC There were 21 tuna in the box at that time. They were all caught in a 30 minute period. Fast and Furious for sure. We boated 100 fish that day. Great time for a couple newbies. This was my sons first trip as captian, 2nd for tuna. My first trip ever commercial. We are supposed to leave again Monday. Galveston340, Chopperdrvr, RattlesnakeDan and 2 others like this. Yup, bleed 'em out right away, more gooder. I never saw "hand lining" fish like that. That is a lot of work especially by the end of the day I assume. Yea, I was pretty sore. In fact my left shoulder still hurts almost 2 weeks later. The hand lining is much faster. We use 300lb test line and just haul em in. You can see he has tuna pullers that we got going. Those things on each side with the split wheel. They are Hydraulic winches that just yard them in pretty fast. Just can't pull too hard or it will rip their jaw off. When I fished the OBx we caught a lot of Albacore I think black one. We called the Alberts. Meat was red and bloody. They we not good to,eat way to oily. This must be a different fish. Now the yellow fins was the idea catch on rod and reel. Much bigger.